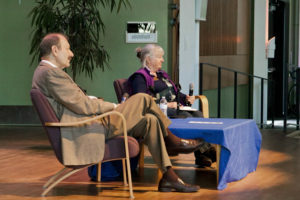 The Student Union Assembly (SUA) concluded its “Meet the Admin” series with a Q&A session with Chancellor George Blumenthal and Executive Vice Chancellor Alison Galloway on Tuesday. Around 80 attendees wrote down questions for SUA President Julie Foster to moderate, and topics ranged from enrollment increase, students who are houseless, the future of athletics and students who are undocumented. City on a Hill Press chose some highlights from the panel. How do you propose the City of Santa Cruz accommodates 650+ more students, both in terms of housing resources and public transportation? Please explain how the city will accommodate these new students. Why, rather than building on previously undeveloped land, is the UC not adding dorms on top of existing buildings that are currently only one or two stories high? Do you serve on any corporate boards? 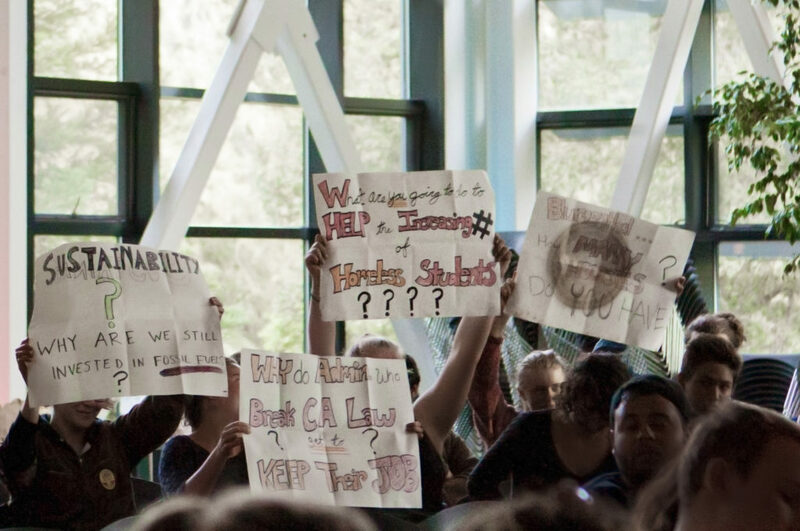 Attendees raised concern about topics like sustainability and student houselessness through their submitted questions and signs. Photo by Ali Enright. Every year we pay more and more for less and less. This is obviously unsustainable. Do you expect things to turn around or become more sustainable and if so how? GB: “Well the truthful answer is I don’t know. In a sense you’re right, students are paying more and more in tuition … and largely the reason for that is that the state of California has withdrawn from the University of California, just as they have done with the [California State Universities] as well. When I was a graduate student at the UC, tuition was essentially free, and today you pay about $13,000 a year in tuition if you’re a California resident. That’s directly attributable to the decrease in funding that we get through the state, so if this is going to turn around there has to be another source of funds. What would the consequences be of blatantly disregarding the mandated enrollment increase and what would [the state and the UC Office of the President] do? GB: “If the UC Office of the President were to ignore the mandated enrollment goals worked on by the legislature it would cost the UC about $25 million in funding. That was clear from the bill that was passed by the state legislature last May. What do you think is the biggest threat to higher education at this institution? GB: The biggest threat to higher education, on this campus, and in California in general is the willingness of the state to actually fund higher education. Just to put it into context, we were almost 100 percent funded by the state when this campus was born, and today, funding from the state accounts for 40 or 45 percent of the educational funding we get. AG: Education has not been a priority both in the state and in the nation. Until we make that a priority again, I don’t see this situation getting better. Next articleWhere are Santa Cruz’s New Voters?